A Journey Through History and the Future For more than 50 years, Antolini has been synonymous with excellence and exclusivity in the world of natural stone. With all the experience gained since the early processes were carried out in the artisan workshop in Sant'Ambrogio di Valpolicella, founded in 1920, and backed up with the great entrepreneurial spirit that is part of the DNA of the Antolini family, the company today continues to evolve ceaselessly through the development of innovative technological thinking and continuous research into exclusive engineering solutions capable of enhancing all the natural beauty of stone. A distinctive feature of the company is the selection and choice of the materials based on the continuous search for the best quarries in the world, a major plus for clients in terms of the quality and variety of the solutions proposed. The choice of the most valuable natural stone is made by selected experts whose skills enable them to identify those regions that offer varieties of natural stone of superior quality. The company's success is founded on certain vital key factors: intuition, the ability to see the quality and uniqueness of a natural stone before others; respect for the past, for the history contained within the materials, for the experience of previous generations who laid the foundations for the development of a major business organisation; openness to evolution and change that continuously drives the Antolini organisation to seek out and blaze new trails in the processing of natural stone in order to obtain faultless products from the aesthetic and modelling point of view. The alchemy between Antolini and the true essence of the material gives rise to unique products. The very roots of the company began and evolved with natural stone and the connection between this precious element to the Earth and its primordial history is the basis of the company's philosophy, as well a means of creativity for those who respect it. Antolini is at the cutting edge in terms of research and experimentation, including in the field of the processing technologies. Indeed, the company has been able to devise and patent processes never before tried and thereby generate exclusive solutions, as well as using only the latest generation machines that increase the quality of the products and reduce environmental impact. 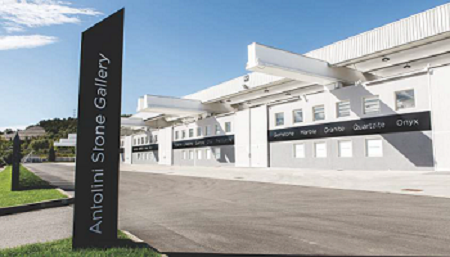 Focus on the company: Antolini's numbers Production: One million square metres produced annually / daily production of 4,500 square metres. Quarries: 30 quarries located around the world, either owned by Antolini or where the company has exclusive rights. Materials: more than 1,000 different types of Marble, Granite, Limestone, Onyx, Travertine, Precious stones, Shell stones and Gemstones. Natural Stone Collections: Marble, granite, onyx, travertine, limestone Natura Collection Woodstone Collection Luxury Collection: Precioustone, Shellstone, Gemstone Jurassic Collection Antolini Quartz Fields of application: RESIDENTIAL (Living, Kitchen, Bedrooms, Bathrooms, Outdoor,….) RETAIL (Restaurants, Bar, Wineries,...) HOSPITALITY (Hotels, Lounge Rooms,...) SPA - WELLNESS SHOWROOMS OFFICES (Commercial, privates, banks) PUBLIC SPACES (Airports, Stations, Museums, …) CONTRACT Countries where the company operates: the company has exclusive showrooms on 4 Continents. In-house showroom: Stone Gallery, Stone Boutique, Marble Pavilion, Onyx Pavilion, Nature Collection Pavilion, Stone Museum, Luxury Pavilion, Lifestyle Plus, Lifestyle.